What information is shared in FIspace between individual companies (apps)? Information is exchange between apps without interaction of Fispace. Fispace only conducts the business flow, but specific message is exchange between apps directly. Could you provide examples of generic enablers, specific enablers and/or domain specific platforms to understand better what our project is? Is there a test account available for FISpace? Who are the end users of FI WARE? Do users need to log in through a personified FI WARE environment or not? 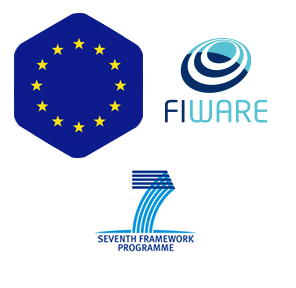 Which FIWARE accelerators are using/promoting FIspace platform? Could you explain an example of using FI-WARE technologies with FIspace (for instance, could you tell me how to link the output of GE Orion Context Broker or GE Cosmos to FIspace)? technologies (GE different from Wirecloud) with FIspace? I would like to have a description of the REST interface used to communicate with the Apps? Message exchanges between app is defined based on the specific case. If my app implements a weather condition scenario, I define the message with required attributes, I integrate this message to a common core and I expose the message to be use by others. Is it possible for an App to know who is logged in? Do all apps have access to the same data, or can I hide data, which should only be shown to some users? Data is exchange between the apps, Fispace manages the business flow. We have come a long way with our cloud app. What are considerations to take if we want to make it compatible with FI WARE? The data used by our application should be in SDI or can be in an external database? Is FIspace the appropriate framework to develop an applications that involve only a single business and end clients? We offer a solution to a specific problem, is the role of business architect then still necessary? Can you give us a brief illustration of the role of business architect? There are two approaches to FIspace, Business Architect and Application Developer. The first one provides "the idea" while the second one implements it. So, try to separate both roles.